Singapore Airlines (SIA) is increasing focus on Australia, particularly the Australia-Asia market, as part of a strategy that sees the group rely less on long-haul routes to Europe and North America. SIA has traditionally been very strong in Australia, which accounts for 18% of its current capacity (ASKs). The group is now well positioned to tap into growing demand between Asia and Australia following its partnership and investment in Virgin Australia. Competition in the Australia-Asia market is heating up as Qantas repositions its Singapore operation to focus on Asia. But SIA at least for now is in a stronger position than Qantas in the Australia-Asia market as Qantas lacks a sufficient number of full-service partners in Asia. Qantas is also following more of a multi-hub strategy for its Asian connection traffic after dropping plans to establish a premium carrier in the region, which gives SIA and Virgin an advantage as they are offering a more uniform and in most cases more convenient Australia-Asia product. The SIA Group currently has about 83,000 weekly return seats between Singapore and Australia, according to CAPA and Innovata data. This represents an increase of about 42% compared to the slightly more than 58,000 weekly seats the group had in the market just one year ago. When excluding budget subsidiary Scoot and only including its two full-service brands – SIA and SilkAir – the group has seen a 24% capacity increase in Australia from about 38,000 to about 72,000 weekly return seats. SIA will be adding even more capacity into Australia on 01-Jul-2013 as it introduces a fourth daily flight to Melbourne and expands Adelaide from 10 to 12 weekly frequencies. The latest expansion will give the SIA Group almost 86,000 weekly return seats between Singapore and Australia, including over 75,000 seats at the SIA brand, about 1,000 seats for SilkAir and almost 10,000 seats for Scoot. Qantas, in comparison, currently has only 67,000 seats to and from all of Asia while its low-cost subsidiary Jetstar has about 38,000 seats. The Qantas figure will decrease by 19% in Apr-2013 to about 55,000 seats. By Jul-2013 there will be a marginal increase to about 58,300 seats after Qantas adds capacity in the Sydney-Singapore and Brisbane-Hong Kong markets. This will give Qantas only a 13% share of the Australia-Asia market, compared to 16% for SIA even though SIA only serves Australia from one Asian point. Qantas’ new partner Emirates also has a 4% share of capacity in the Australia-Asia market while SIA’s partner Virgin Australia has a 3% share. Of the 58,300 seats that Qantas will operate to and from Asia under its new post-Emirates structure, almost 35,000 are to and from Southeast Asia, compared to over 41,000 currently. The remaining 23,400 seats are to and from North Asia, compared to almost 26,000 currently. While Qantas will be reducing seat capacity to Southeast Asia by about 15% and to Asia overall by about 13%, there will be a significant increase in capacity available to the local Australia-Asia market as a large portion of Qantas flights to Asia are now allocated to Europe. Qantas now operates two daily A380 flights to London via Singapore and one daily 747-400 flight to Frankfurt via Singapore. The Frankfurt flight is being terminated at the end of Mar-2013 and at the same time both London flights will be routed via Dubai as part of Qantas’ new comprehensive partnership with Emirates. Qantas estimates that it will have 40% more allocated seats for the Asian market. All of this increase will come in the Singapore market as Qantas is not adjusting capacity to Bangkok, where it currently has about 4,000 return seats. Hong Kong capacity is decreasing by about 16% as Qantas drops Hong Kong-Perth and reduces Hong Kong-Sydney from 11 to seven weekly flights (these cuts are partially offset by increasing Hong Kong-Brisbane from four weekly flights to seven). Qantas terminated services to London via Hong Kong and Bangkok as part of an earlier restructuring of its unprofitable international network in Mar-2012. As Qantas currently does not serve Europe from Hong Kong, the upcoming decrease actually will result in a decrease of capacity in the overall Australia-Asia via Hong Kong market as Qantas focuses on Singapore as it increases the number of seats allocated to Asia. In Singapore, Qantas will see its total capacity drop by 52% from about 50,500 weekly seats currently to only about 24,000 seats by the end of Apr-2013. But the European services account for most of this decrease, or about 18,000 weekly seats. Several adjustments to the carrier’s Singapore-Australia operation account for the remainder. As Europe-bound passengers now account for about half of Qantas’ Australia-Singapore traffic, the net result is a large increase in local Australia-Singapore capacity. But from a network standpoint Qantas will have a much weaker position in Singapore. Qantas will be left in Singapore with only five daily frequencies to four destinations: Brisbane (retaining one daily flight); Melbourne (retaining one daily flight); Perth (dropping one of its two daily flights) and Sydney (ultimately retaining two daily flights with 11 weekly frequencies as part of an interim schedule from April to June). Qantas, which currently serves Singapore from eight destinations, is also pulling out of the Adelaide-Singapore market at the end of Mar-2013. SIA’s strength in the Australian market increased significantly after the carrier implemented a tie-up with Qantas’ archrival, Virgin Australia, in early 2012. While Virgin Australia does not serve Singapore, the partnership allows SIA to target Virgin’s frequent fliers and corporate accounts. The frequent flier tie-up with Virgin and the ability to offer domestic destinations in Australia beyond its five Australian gateways is enabling SIA to put more capacity into the Australia market. It also made possible the Apr-2012 launch of SilkAir flights to Darwin, a route which without the Virgin Australia tie-up would not have been viable. In Oct-2012, SIA unveiled plans to acquire a 10% stake in Virgin Australia, further cementing the partnership. While a large portion of SIA’s passengers to and from Australia continue to transfer in Singapore to Europe, where SIA has 13 destinations, a majority of its Australia passengers are now heading to Singapore or elsewhere in Asia. SIA has seen a steady drop over the last several years in “kangaroo route” traffic between Australia and Europe as a result of more intense competition, primarily from Gulf carriers. Two of SIA’s main competitors in this market, Emirates and Qantas, will become tougher competitors in Mar-2013 as they implement their new partnership. Etihad is partnered with Virgin Australia in the Australia-Europe market while Qatar Airways is now discussing a partnership with British Airways which will likely result in BA moving the stopover of its London-Sydney service from Singapore to Doha. Chinese carriers have also started aggressively targeting the Australia-Europe market, resulting in a further drop in yields. SIA’s response is to focus more on the Asia-Pacific market. Demand for travel within Asia-Pacific, including Australia to and from Asia, is increasing more rapidly than long-haul markets such as Asia-Europe and Asia-North America. 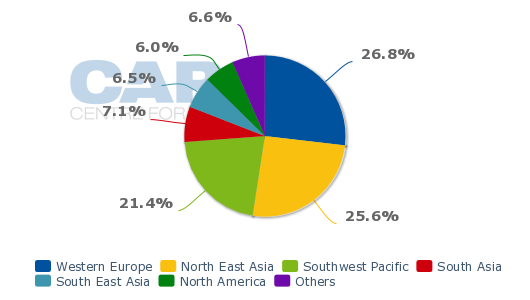 SIA is unlikely to significantly increase capacity in the near to medium term to Europe or North America, which accounts for 27% and 6% of its ASKs respectively. The group is instead expanding in Asia-Pacific using a combination SIA, SilkAir and Scoot – with SilkAir focusing mainly on short-haul markets and SIA and Scoot mainly on medium-haul markets. Australia-Asia is generally a less competitive market than Australia-Europe. Singapore is well positioned as a hub for traffic within Asia-Pacific, a position Changi Airport is now trying to reinforce as Changi’s status as a kangaroo hub continues to diminish following the upcoming withdrawal of Qantas services from Singapore to Europe (and BA’s likely withdrawal from the Singapore-Australia market). 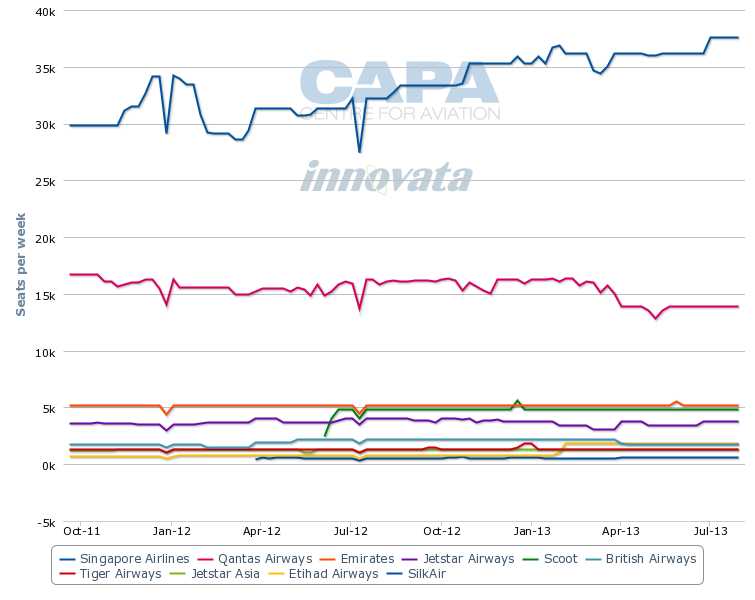 For now SIA (and its partner Virgin) is better positioned to serve the Australia-Asia market than Qantas. While Qantas will significantly increase the number of seats allocated to the Australia-Singapore and Australia-Asia markets, resulting in increased competition with SIA (and hence with its archrival Virgin), it still lacks two major items – frequency and strong regional partners. Being able to offer passengers a choice of four frequencies in three of Australia’s four main markets, and three daily frequencies in the fourth market, gives SIA a big advantage as Qantas looks to up its game between Australia and Asia. SIA also offers a much bigger network of connection destinations in Asia with far more frequencies, resulting in faster connection times and a bigger range of options. SIA has almost 30 destinations in Asia and allocates about 60% of its seats to markets within Asia (excludes Australia and New Zealand) while SilkAir serves over 40 destinations. Qantas is attempting to compete against SIA in the Australia-Asia market with a patchwork of partners which currently provides codeshare service to a relatively limited number of Asian destinations. In its 04-Feb-2013 announcement of further network changes in the Australia-Asia market Qantas cited an “expanded network within Asia through local partners such as Japan Airlines, China Eastern, Jet Airways, Cathay Pacific and Malaysia Airlines”. But when added up these partnerships are not nearly as strong to match SIA and hence Virgin Australia. Missing from the recent list of Qantas partners in Asia is its low-cost affiliate Jetstar Asia. Singapore-based Jetstar Asia and sister carrier Valuair have a large network consisting of 23 destinations. But Qantas currently only codeshares with Jetstar Asia to 11 of these destinations and even with the re-timing of Qantas’ Australia-Singapore flights, same day connections are currently only available in both directions to four destinations – Bangkok, Ho Chi Minh, Kuala Lumpur and Phuket. Qantas does not seem interested in more actively promoting Jetstar connections for its Australia-Asia passengers, perhaps recognising that its Australia-Asia passengers prefer to stick with a full-service product for the entire journey. Premium passengers and economy class passengers booking via corporate accounts are particularly wary of connecting to Jetstar flights. Without a stronger Jetstar Asia-Qantas relationship, Qantas could inevitably struggle to fill seats on its new Singapore schedule. Jetstar already has a strong connection product in Singapore, where the Jetstar group has about a 7% share of capacity (includes Jetstar Airways, Jetstar Asia and Valuair). But connections in Singapore are now mainly between Jetstar flights including Jetstar-operated long-haul flights to Singapore from Melbourne and Auckland. Over time Qantas will need to relook at better leveraging the Jetstar network in Singapore. Qantas is more heavily banking on its partnership with Jet Airways, which it needs to access the large and fast-growing Australia-India market. Qantas is Jet Airways’ largest partner in Singapore and has traditionally carried a large number of Qantas passengers on its flights from Singapore to Delhi, Mumbai and Chennai. Qantas needs to maintain and expand its partnership with Jet as Virgin Australia has access to the over 10 Indian destinations of SIA and SilkAir. But it could be jeopardised as Etihad, a partner of Virgin Australia and the biggest rival of Qantas partner Emirates, is now looking to acquire a stake in Jet. Malaysia Airlines (MAS) also has strong network in India as well as Southeast Asia. But while MAS is a new member of oneworld and its entry into the alliance was sponsored by Qantas, the relationship between the two carriers has soured significantly as a result of Qantas’ partnership with Emirates. The partnership includes a codeshare on Emirates’ flights from Melbourne to Kuala Lumpur (as well as from Sydney to Bangkok and Brisbane to Singapore). But Emirates, which is the largest foreign carrier at Kuala Lumpur, is a big rival to MAS and MAS is not keen on indirectly feeding Emirates operated flights to Australia through an arrangement with Qantas. Qantas is also unlikely to launch service to Malaysia and is unlikely to work with MAS on Australia-Malaysia flights, making a partnership in the broader Australia-Asia market virtually impossible. MAS and Qantas currently only codeshare on Singapore-Kuala Lumpur, a route also operated by Jetstar Asia, and do not cooperate on Australia-Malaysia flights. MAS is currently unable to add capacity into Australia due to bilateral restrictions, which is a potential advantage to SIA and other carriers in the Australia-Asia market. Qantas in 2011 looked at establishing a joint venture carrier for the Asia-Pacific market. It explored two options – including a joint venture with MAS, known as project Orca, and a Singapore-based regional premium carrier with a Singaporean non-airline partner, known as the RedQ project. If either project had been launched, Qantas would have had a stronger Australia-Asia product and a single strong hub for Australia-Asia passengers. The current alternative of a combination of hubs and a range of partners represents less risk for Qantas but more of a challenge for trying to capture a larger share of the Australia-Asia market. Based on a random sample of Australia-Asia city pairs, SIA (and therefore Virgin) has in nearly all cases a more convenient and in many cases a better priced product. Thai Airways and MAS also often have an edge over Qantas in most Australia-Southeast/South Asia city pairs. Note: Based on return travel for select dates in Apr-2013. Transit times shown are quickest connections for outbound and inbound legs. *Qantas does not have any codeshare partners to Phnom Penh. On Melbourne-Mumbai, Qantas offers codeshare via Singapore with Jet Airways. On Canberra-Beijing, Qantas offers codeshare with Jetstar via Singapore on outbound leg and codeshare with Cathay/Dragonair via Hong Kong on the inbound leg. Relying on partners through interlines and codeshares can drive up the cost as well as result in longer connection times. Not having a single Asian hub like its rivals also results in more complicated itineraries for passengers. Qantas also has huge white holes in its Southeast Asian offline network, a weakness SIA and Virgin Australia are currently exploiting. Qantas currently does not have any codeshare destinations in several Southeast Asian countries including Cambodia, Laos and Myanmar. It also only has one codeshare destination in Malaysia and only one codeshare destination in Vietnam. India and China are better served with codeshares from Jet, China Eastern and Cathay/Dragonair. Qantas will need more full-service partners in Southeast Asia. A stronger relationship with Bangkok Airways would be one option. Qantas now codeshares with Bangkok Airways to some domestic destinations in Thailand, including Koh Samui and Chang Mai. But Qantas does not codeshare yet on Bangkok Airways’ international network, which includes destinations in Cambodia, Laos and Myanmar. Qantas has talked up an expanded partnership with China Eastern, which now includes codeshares on domestic services within China and Australia. The codeshare could extend to Hong Kong, which China Eastern serves from several cities in mainland China. A strong China Eastern partnership is key for Qantas’ evolving Asian strategy, particularly if Qantas does not end up working closely with Jetstar on services to and from China. Jetstar has a large network to China from Singapore and will start building a mainland China network from Hong Kong after the launch of Jetstar Hong Kong in mid-2013. China Eastern is Jetstar's partner in the Jetstar Hong Kong project. See related article: Qantas and Virgin Australia look for new Asian partners: China Eastern for Qantas and Cathay for Virgin? But there are limited to no opportunities to work with China Eastern in Singapore, where most of Qantas’ Asian capacity will be allocated. China Eastern only serves four destinations from Singapore with most capacity allocated to Shanghai. Qantas already codeshares on China Eastern’s Shanghai-Singapore service but this is of limited value except for Perth passengers because Qantas already serves Shanghai with its own metal from Sydney. There are also limited opportunities to work with JAL in Singapore as JAL only serves Singapore from Tokyo, which Qantas also serves with its own metal from Sydney. Bangkok Airways also has only one destination from Singapore, Koh Samui, and Qantas currently only has one daily flight to Bangkok (from Sydney). Qantas may ultimately need to re-look at how it distributes its Asia capacity depending on who it is able to secure as partners for the Southeast Asian market. Having its main Asian hub in Singapore is logical given Qantas’ long history in Singapore and the fact it is the base for Jetstar Asia. But if Qantas does not have enough full-service partners in Singapore, the concept of an Asian hub in Singapore could fail and Qantas may have to further cut capacity at Changi Airport in favour of more capacity at rival airports such as Bangkok or Hong Kong. Qantas currently has a 4% share of total capacity at Singapore, which makes it the largest foreign full-service carrier at Changi Airport. But Qantas’ capacity share at Singapore will drop to only 2% in Apr-2013, resulting in Qantas becoming only the third largest foreign full-service carrier at Changi after Cathay Pacific and Emirates. The SIA Group, which accounts for about 55% of full-service capacity in its home market, along with its partner Virgin Australia, is much better positioned to exploit Singapore’s status as an Australia-Asia hub. Qantas faces an uphill battle trying to overcome SIA and Virgin Australia in the Australia-Southeast Asia market. MAS and Thai Airways are also formidable competitors and have the Australia-Southeast Asia network which Qantas still lacks. This is the second article in a two-part series on the Australia-Asia market. The first article looked at how Qantas is targeting the market with new schedules and a revised strategy. Note: Qantas schedule changes which were announced on 4-Feb-2013 has not yet been captured by Innovata.